서울시에서는 외국인들의 기업활동을 돕고 생활 불편을 줄이기 위해 2008년 말을 예정으로「글로벌 존」을 조성 중에 있다. 이는 거주 및 방문 외국인들에게 행정 서비스와 의료 및 관광 정보 등을 제공하는 목적으로 운영될 예정이다. 서울시 안에 지정되는 글로벌 존은 글로벌 비즈니스 존 4개소, 글로벌 빌리지 6개소, 글로벌 문화교류존 5개소로 총 15곳이다. 서울시에서는 이를 통해 외국인에게 비우호적인 서울의 비즈니스, 생활, 교육 환경 등을 개선해 외국인 투자를 유도하고 서울을 세계적 허브도시로 발전시키려 하고 있다. Seoul Metropolitan Government creates global zones that are expected to be completed in late 2008, in order to help foreigners do business in Korea and resolve their inconveniences. The zone will provide administrative and medical services as well as tourist information to foreign residents and foreigners who visit Korea. 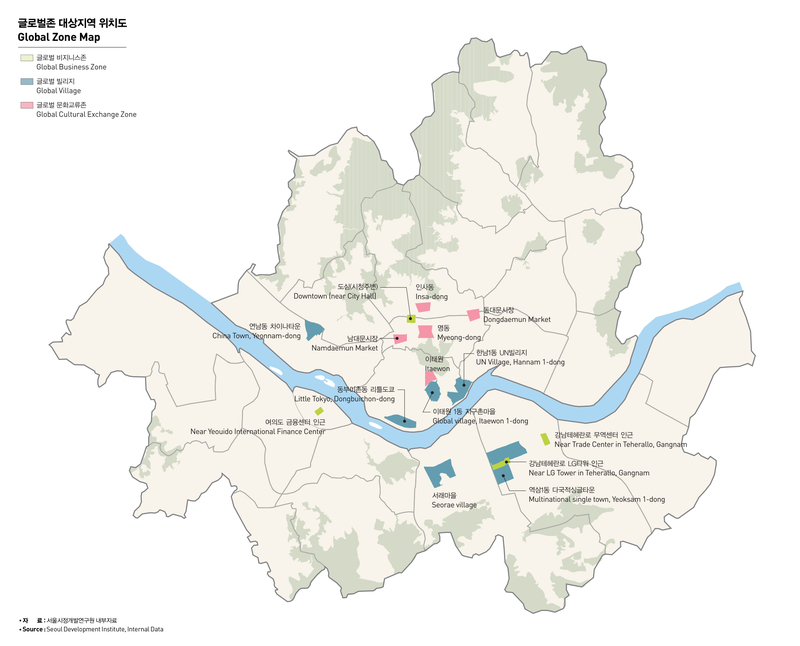 Global zones designated in Seoul city are made up of 4 global business zones, 6 global villages and 5 global cultural exchange zones. Seoul seeks to induce foreign investment and transform itself into the world-class hub city by improving its business, living and educational environment unfriendly to foreigners.